Leslie Cerier’s sweet potato fries are a healthy way to be a little decadent. Sweet potatoes are loaded with beta-carotene and other vitamins and minerals; hemp seeds, a complete protein, are rich in omega-3s, fatty acids, fiber, minerals, and vitamins; and kelp has Vitamin C, calcium, iron, manganese, and magnesium. These are three of Leslie’s favorite foods, and crisp-frying the sweet potatoes in three tablespoons of cannabis-infused virgin coconut oil seals the deal. Virgin coconut oil, made from fresh coconut meat, has more nutrients than refined coconut oil, made from dried coconut meat, and a lower smoke point of 350 degrees Fahrenheit. 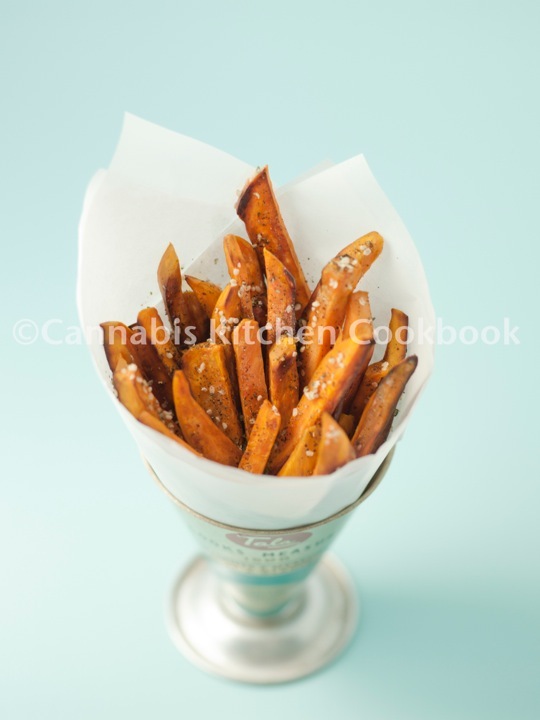 That’s just right for cannabis fries, as conventional wisdom holds that THC will degrade if food is cooked above 350 degrees. The THC in Leslie’s fries doesn’t degrade, so tread lightly. Don’t eat them like they’re from Umami Burger. Two or three make for an enjoyable meal; six is probably too many; nine lands most people on the sofa for the night. Cut sweet potatoes into 4 or 5 vertical pieces, then cut each piece into french fry sticks. Set aside. Melt and heat coconut oil in a large skillet. After a few minutes, stick the end of a wooden spoon into the oil. When bubbles form around the wood and start floating to the top, the oil is ready for frying. Add sweet potatoes and fry, covered, for 5 minutes or until potatoes are almost yellow. Flip over and fry for about another 2–3 minutes or until tender. Fork test for doneness. Garnish with hemp seeds and kelp flakes. Serve immediately.